The Link Electronics ASW-822 is an eight input, two output, balanced audio switcher. It offers an switchable second output and remote control via RS-232. An RJ-11 telephone connector allows several audio follow units to operate in tandem. 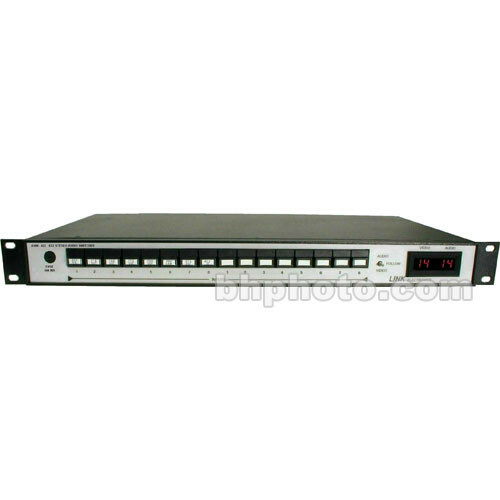 This unit operates in an audio follow situation for VSW-800 series video switchers or as a stand alone device. This unit was designed to work with VSW-800 series video switchers as an audio follow unit but, has the ability to operate in a stand alone configuration. RJ-11 connectors allow units to be cascaded and operated in tandem for multi-levels of audio switching. This unit fits in existing studio rack space without extraneous equipment. Dimensions (WxDxH) 19 x 8.7 x 1.75"
Box Dimensions (LxWxH) 21.0 x 20.0 x 6.0"